How long will cyclists be protected from traffic accidents on Dyckman Street? In Upper Manhattan bicyclists are now protected from dangerous accidents by a new bike lane on Dyckman Street. The bike lane was installed last December. It connects the Hudson River and East River Greenways (see map). It took nine years for the Inwood residents to get the NYC Department of Transportation to install a parking-protected bike lane where the traffic is heavy, as painted bike lanes where the traffic is lighter and sidewalk extensions to reduce crossing distance for pedestrians and slow down traffic. However, few months after its installation, the bike lane is now threatened by local politicians. Adriano Espaillat and Gale Brewer don’t seem to care about bicycle accident prevention. They are asking the DOT to remove the bike lane and to install it two blocks North on 204th Street. 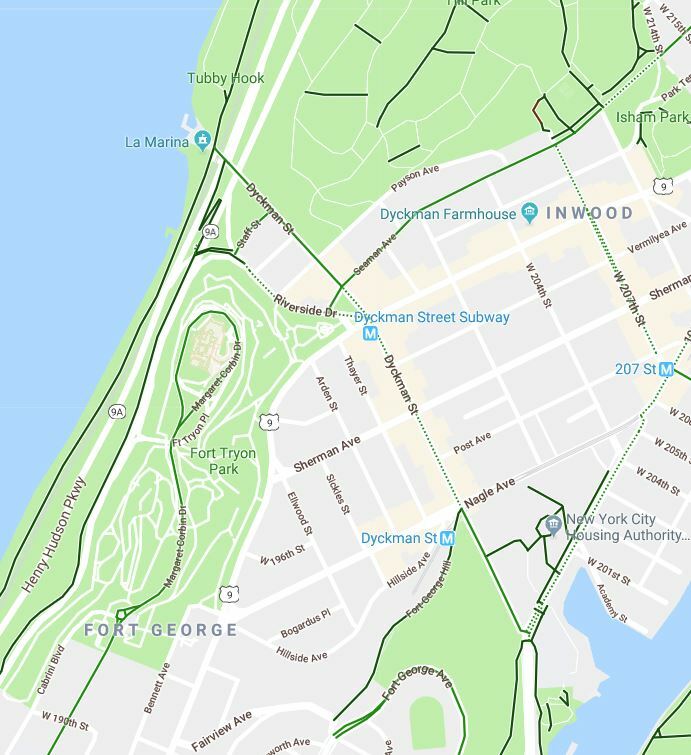 Dyckman Street is a very lively commercial street and the bike lane is not only protecting the delivery staff working at the many restaurants located on the street but also cyclists who are touring Manhattan and may want to make a pit stop between the two Greenways. Forcing bicyclists to go a few blocks away may result in confusion and additional bike accidents. In a recent meeting, small business owners also complained to City Council member Ydanis Rodríguez about the bike lane. They said the bike lane prevented clients from parking in front of their businesses and made it difficult for suppliers to deliver merchandise. They also said the bike lane was creating traffic congestion. If Rodriguez joins forces with Espaillat and Brewer, there is a chance that the DOT removes the bike lane without much public discussion. Over the last 9 years 300 people were injured in traffic accidents on Dyckman Street. There is a good chance that this number goes down if the bike lane stays.